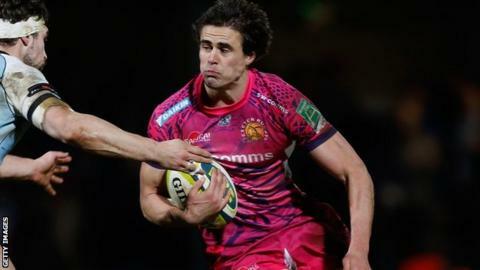 Worcester Warriors have signed Exeter fly-half Ignacio Mieres. The 25-year-old, who is will move to Sixways in the summer. "He wants to play a bit more rugby than he's playing this year," said Exeter assistant coach Ali Hepher. "He's an ambitious guy and wants to play for Argentina, and realises that with the lack of game time he's going to struggle to push on into that international team." Mieres has spent three years with the Devon club after joining from Argentine side Deportiva Francesca in October 2010. He has scored 395 points in his three seasons at Exeter, including four tries, and played twice for Argentina in the summer against France and Italy. He also has experience of playing in France having featured for both Stade Francais and Perpignan, and was on Leicester's books from 2007-08. "It's a tough situation - we have some quality fly-halves and unfortunately he hasn't had the kind of game time that he would have wanted," Hepher told BBC South West Sport. "We're doing what's best for the players at the end of the day. "We want people like Nacho to be ambitious and he wants to push his claim for the international scene. "We could have kept him but we don't want to keep players who don't fancy being here." Mieres' signing throws into doubt the future of Andy Goode at Sixways, after from Stade Francais last month.